Accidents involving motor vehicles are the principal cause of traumatic injury to the spinal cord. Other etiologies, in descending order of frequency, include falls, gunshot wounds, and injuries secondary to sports or recreational activities. Compression fractures result from axial loading and flexion, with subsequent failure of the anterior column ( Fig. ...248-3). The middle column remains intact. These injuries are usually stable unless they are greater than 50 percent. They are unlikely to be directly responsible for neurologic damage. FIG. 248-3. 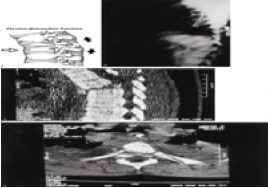 Wedge compression fractures are often caused by axial unloading with failure of the anterior column. A, Schematic of a compression fracture. B, Lateral reconstruction of a CT demonstrating the anterior wedging. C, Demonstrates the anterior wedging and vertebral body fracture. Note the lack of retropulsion of elements into the spinal canal. 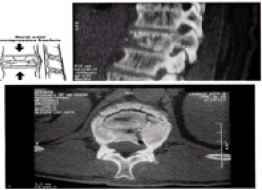 Burst fractures occur following failure of the vertebral body under axial load ( Fig.. 248:4). In contrast to compression fractures, both the anterior and middle columns fail. 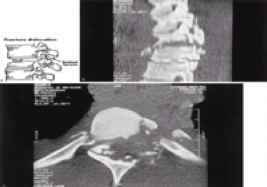 There is retropulsion of bone and disk fragments into the canal. This may cause spinal cord compression. FIG. 248-4. 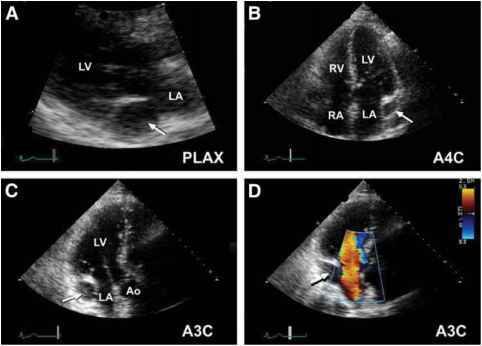 Burst fractures are also caused by axial unloading. Both anterior and middle columns have failed. A, Schematic of the forces transmitted. B, Lateral reconstruction CT scan demonstrating failure of both the anterior and middle columns. C, Demonstrates the burst vertebral body. Note the retropulsion of elements into the spinal canal. Flexion-distraction injuries are commonly seen following seat belt-type injuries, particularly where lap belts alone are used ( Fig 2.4..8:.5.). The seat belt serves as the axis of rotation during distraction, and there is failure of both the posterior and middle columns. The intact anterior column prevents subluxation. 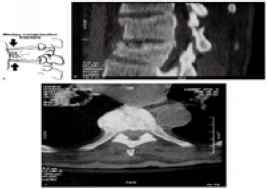 Typical radiographic findings reveal increased height of the posterior vertebral body, fracture of the posterior wall of the vertebral body, and posterior opening of the disk space. FIG. 248-5. Flexion-distraction injuries involve rotation of forces. This results in failure of both the posterior and middle columns. A, Schematic of the forces transmitted. B, Plain films demonstrating a flexion distraction injury. C, Lateral CT reconstruction confirming the pattern, also demonstrating posterior opening of the disc space. D, Shows loss of the middle column with fracture through the lateral elements. Fracture-dislocations are the most damaging of injuries (Fig 248-6). Compression, flexion, distraction, rotation, or shearing forces lead to failure of all three columns. The end result is subluxation or dislocation. FIG. 248-6. Fracture dislocations are the most damaging of injuries leading to failure of all three columns. A, Demonstrates these injuries schematically. B, Lateral CT reconstruction demonstrating loss of all three columns. C, Demonstrates the dislocation and displacement of the vertebral body. Now if this is what you want, you’ve made a great decision to get and read this book. “How To Cure Yeast Infection” is a practical book that will open your eyes to the facts about yeast infection and educate you on how you can calmly test (diagnose) and treat yeast infection at home.